Cooper on board Coeur Sublime at Down Royal in November. ISN’T IT FUNNY how very few break-ups we have had were amicable yet the sporting ones are so often portrayed as such? How many managerial departures are by “mutual consent”? In reality, something like the figure according to what the relevant parties might want you to believe – to the power of none. In racing, Michael O’Leary has had his share of break-ups, usually on his terms. 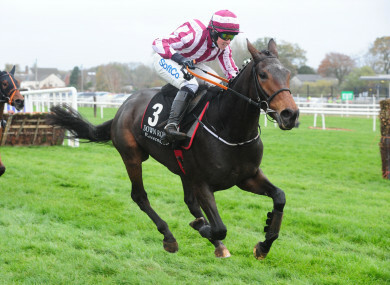 He had two retained riders and sacked both, though neither departure was as high-profile as the severing of ties with Willie Mullins in late 2016. Then there were those who trained high-profile winners for the operation at the track but were not given any more horses. Ask someone random in Ireland and he or she will probably tell you that O’Leary is a ruthless so-and-so – and you might be talking to one of his trainers or jockeys. But the bottom line is what matters to the Ryanair boss and the bottom line in another sense is that you could see why every sacking occurred. Bryan Cooper sensationally lost his job as O’Leary’s main jockey just three days before the Galway Festival of 2017. “If it lights a fuse under Bryan like with [his predecessor] Davy Russell, all the better for Bryan,” Gigginstown racing manager Eddie O’Leary said at the time. Cooper had ridden for just three trainers that season other than a Gigginstown ally or his father Tom by the time he was sacked, implying a lack of urgency. The general feeling is that he was sacked because he was not working hard enough. I won’t lie: it was quite tough to take,” Cooper told me some months ago. “I had an unbelievable Punchestown that year… and thought, ‘Right, maybe I might get another year’. “I knew it was never going to last forever, genuinely I thought ‘Maybe if I get one more year out of it, it will be great’ and I did go up [to Punchestown] thinking I might get another year out of it and when he did say ‘You’re finished’… it did hurt because everything is thrown into that basket. His broody nature betrays the pedigree, trainer Tom very much his son’s father (“when dad is in bad form, I put the phone on silent for a few days,” his son says, only half-joking). Bryan is not even in the top 20 jockeys in Ireland this season by winners – a pathetic decline – but things were not as bleak as they seemed. That is because Cooper has two major allies in talent and time. He rode a winner for Paul Nolan on Monday at a chilly Down Royal, bizarrely the only scheduled fixture this week in Ireland until Dundalk today, and these ordinary meetings can illuminate in their own way. Just as Patrick Kavanagh yearned to “wallow in the habitual, the banal”, some light shone from the mundanity of the meet and Cooper was one of the highlights. He was excellent on the Paul Nolan-trained winner, Cresus De Grissay, and the way he spoke to the press afterwards suggested the fire was burning again. Cooper likes a life outside of racing but when he puts his mind to it he is a gem of a rider. The other thing is that Russell is getting on in years, Barry Geraghty and Ruby Walsh nearing 40. A young Bryan Cooper and his father Tom. In 2014, he suffered an injury at Cheltenham that could have finished his career. Tom Cooper has argued that the mental strength shown by his son during his injuries was “incredible” for a man of his age – but he is 26 now, and that does not matter anymore. The retirements of those big names leaves a gap to fill and Cooper is as talented as anyone else left. “The day he won the Gold Cup on Don Cossack,” Nolan recalls, “he came back into the owners and trainers’ bar and let nobody near it bar his father, family and pals – he was so happy and relieved, as we were too, a fantastic achievement in a tough sport. And believe you me it’s tougher at the bottom. While the owner has insisted there is no alliance, Chris Jones has been a major influence in the Cooper revival, giving him 14 rides this season – at least double that given to any other professional. A modest return of one winner (Coeur Sublime in a maiden hurdle), with seven others horses finishing in the first four, only tells some of the story. That the Kerryman has not been given the ride on Coeur Sublime at Leopardstown on Sunday, day two of the Dublin Racing Festival, rates another kicking for him. One of our best juvenile hurdlers, the pair exited at the last at Christmas when in with every chance. Cooper does not ride any of Jones’ runners this weekend. I can see more than ever that I took the good days for granted now. It is unbelievable just to be supported again by a big owner,” Cooper told me earlier this week. “I’d nearly a full book of rides on Stephen’s Day – a massive stepping stone compared to the same time 12 months ago when things were bad. That was for Nolan, who along with Henry de Bromhead, gives Cooper a ride tomorrow. He is idle on Sunday, something that will be on his mind when he watches the rugby on Saturday night. “When you are sitting around moping you feel sorry for yourself and then things go belly-up,” he says. This is a critical year for him, and he needs to keep telling himself that. Prunella Dobbs, meanwhile, has done an age without a jumps winner and had a poor campaign in 2018 on the Flat but her horses will be well-treated when they hit form and Carried looks liable to go close if he can get out in front in the 5.30 at Dundalk tonight. Gavin Cromwell featured in our piece last weekend. He provides a lively sort in Jeremys Flame in the final race of the Dublin Racing Festival. The filly’s dad, the late Jeremy, is the sire of Jer’s Girl, Cromwell’s first top-notch horse and which began a relationship with JP McManus that resulted in Espoir D’allen being brought to his yard near the Hill of Tara. This filly too can reach enviable heights. So can Cooper if he is hungry enough to grasp his second chance. Email “Cooper has got talent and time on his side to grasp second chance ”. Feedback on “Cooper has got talent and time on his side to grasp second chance ”.